Are you ready for tonight's two-hour Counting On special, featuring Joy Duggar and Austin Forsyth's wedding? Be sure to grab a box of tissues before you sit down to watch. In the video clip below, shared via People.com, the bride and groom have their first look shortly before their wedding ceremony, and Austin also unveils a special gift for Joy that has been months in the making. 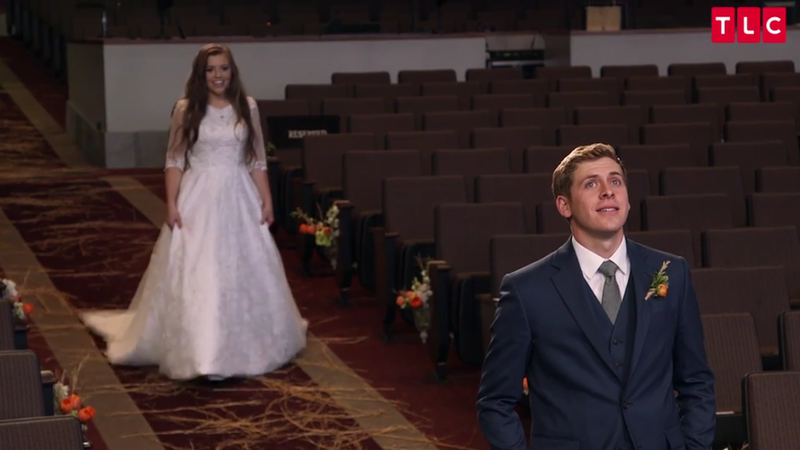 Also on tonight's episode, viewers will see more of Joseph Duggar and Kendra Caldwell, as their courtship continues and Joseph asks Pastor Caldwell's blessing to propose. The show will start one hour early (8pm ET/7pm CT) and run for two hours. I feel sorry for Joy. Nothing about her life has been private. The cameras are everywhere, even in their face as they talk to one another before the wedding. You shouldn't feel this way. She has a choice. She chose to stay on the show and have the cameras on her life. Don't pity her. Once the contract ends she doesn't have to renew it. Joy never had the choice to be on the show. Her parents made that decision for her. Now that she is married she must obey austin. If Austin wants to continue filming then joy must submit to his desire to do so. Anon 8:44 They were raised on a reality show so she wouldn't be bothered about not having privacy. It is how her parents earned a living and now how she earns a living. That's what reality shows do, they sell their lives for money. Exactly!!! She chose this show. Love the shadow box! i hope someone redid her hair before the ceremony. I don't think so...her hair was very loose. "Austin wants it this way"
No, that's the way it was for the ceremony. So much coverage on one event? I suppose TLC is short on material, so it's wedding overkill. wedding overkill on the blog, also. I can't get the video to play, but the People article says he saved the flowers he gave her? How did he manage to do that? Improperly dried flowers turn into smelly, gray compost... What a romantic gift. If you didn't see the video and you don't know what the flowers looked like, why would you jump to the unlikely conclusion that he would give his bride smelly, gray compost? It's really easy to dry flowers, by the way. Dried flowers turn brittle and weird colors and yucky! Not a great gift. He could have picked up stones from everywhere they went, even that rock where he asked her to court, and they would have lasted forever. The flowers in that picture frame are only going to deteriorate more as the years go by, until they're dust. I have good news for you. They briefly showed the shadow box on the wedding special, and the flowers were properly dried. He did not put smelly, gray compost in the shadowbox. So you're saying he should've given her a box of rocks? I thought a groom wasn't supposed to see his bride in her gown until the church doors open and in she walks, during the start of the ceremony. Seeing her beforehand takes that big moment away. Was this Austin's idea, or Joy's? People do first looks allllll the time! It's their choice! What business is it of anybody's when a groom sees his bride??? It is not a law. It is an outdated "tradition" based on arranged marriages when parents would find a bride for their son and he was not allowed to see her until they said I do in case he looked at her and refused to marry her because she was not pleasant to look at. That is where the "tradition" of the veil comes from too. The bride's face was literally covered (veiled) so the groom could not see her face until the deal was sealed with the pronouncement. Time to discard those silly traditions, don't you think??? And just because you want to keep that tradition, does not mean that everybody else should have to if they don't want to. Jill did the same with Derrick and Jessa with Ben. Didn't watch Jinger & Jeremy' wedding. It's unheard of here in UK but from what I've seen in some Christian circles in US its common. Personally I don't get it the bride dressed up seeing her groom before the ceremony. It's been trendy for the past few years to do this "first look". Some couples do a "first look" so that their first moments seeing each other in their wedding clothes can be more private. Not seeing each other ahead of time that day is just a custom, probably with a superstitious background like a lot of wedding customs. I wanted my groom to have that feeling when he saw me enter the church, not beforehand! What fun is that? By the time you're standing at the altar together, he's already over how you looked to him, if he sees you first. Then it would be like, "Let's get this done so we can go to the reception." In Germany tradition (not done often nowadays though) is for bride and groom to walk down the aisle together. We took photos first and then walked in together and we just loved it, having this time together before everything else starts. Johanna, that sounds really nice. I don't know, Austin was still pretty emotional with his "second look." I don't think it spoiled it all for him. WHY are they airing 2 hours of something we've already seen?!?! Really. I'm not going to watch it & get "deja-vu all over again." We haven't seen all of it. The wedding special a few months ago was only an hour long. So that people who want to watch and enjoy the story can do so. There will always be those who want to see everything and don't mind reruns and others who don't want to see them. The fact is we all have a choice to watch or not. Like any other show if you don't want to watch, move on. So, So precious ... love watching this family ... especially the older kiddos as they go forward in relationships! Do you know if it's going to be the same episode as the one we saw in july ? New material ? The previous episode that showed the wedding was just a "first look." Tonight's episode is a 2-hour special which will feature new footage. Oh, wow. I didn't know they had a first look. I watched the episode, but they didn't show that part. I wonder why? This is beautiful and I am glad they shared it. I am sure if they had wanted to they could have said no, however they do share. Aww... this is so sweet! Joy's face is just glowing! it did seem like a very sweet Moment that should have been kept private. They don't seem to treasure anything as private. That was beautiful! The framed roses and the letter! I also have all the roses my husband has given me from when we were dating and all throughout our marriage. We've been married 11 years. There is no magic in keeping dead flowers. 10:33 -- What an unkind comment. I wonder what motivated you to post that? No, but there are sentiment and memories. I do not understand this practice of a "first look". Jill did it, and now Joy has done it, and it is not something I've ever heard of before, and it takes away from the big moment of the bride walking down the aisle. It's actually quite common now... I wouldn't do it but hey, if you want to, go for it. this is not something new, although calling it a 'first look' may be new verbiage. my parents were married in the 50's and it was common practice to have the majority of the wedding pictures taken before the wedding. That is one of the sweetest things ever! I am so happy for them to be so in love, and that they are having a baby next year too! I feel like Joy cares more about Austin than Austin cares about Joy! She's so adamant about making sure she'll look and be perfect for him but other than preparing the house, he was never really gushing about Joy. He always looked kind of annoyed when talking about her actually. Maybe he is just a private kind of person who does not easily talk about his feelings, especially on tv to millions of people.....does being negative come this easily to you??? I think so. He's so reserved on camera. Hope that's not his true persona. If so, big mismatch. Your wrong. Austin has a quiet nature. Some people just don't seem very excited when they talk. Remember the shadow box he made for her, the well thought out proposal plan? Did you seriously just say that? His eyes and vows tell you his feelings. I have seen those eyes in my own life and know what they mean. Some of you might want to reevaluate your thoughts after watching Austin pull back from Joy last night when she wanted to kiss him... That said it all! He was teasing her. It was playful. I can only hope my own daughter has a man that looks at her like Austin looked at Joy while saying their vows and be able to be a serious yet playful loving husband. Austin isn't as vocal about his feelings, for sure, but his eyes say it all. I think it's pretty mutual. Just don't understand why this is such a big deal since we all saw it months ago. The girl's lives are interesting enough without all the rehashing. Their lives aren't interesting enough; that's why the show drags everything out the way it does. How many times can we really watch Jessa change a child's clothes and then botch a simple dinner, or listen to Jill talk about "Central America" being dangerous. No, apparently their lives aren't interesting enough. They are well compensated, I don't think they feel so sorry. I just don't think that this moment should have been 'for the world' to hear and witness. It's a very private moment and the cameras should NOT HAVE BEEN THERE. Then, the Duggars get offended when questions are asked about very obvious things and they say that they're private matters....can't have it both ways. Joy also sounded like a kid; she's very young and still immature to marry anyone...as it Austin, really. Absoloutely beautiful. Congrats to you awesome pair. You make a valid point. People seem to think that having a reality show is nothing but easy money and a positive. I do not think that psychiatrists or mental health professionals have a clear understanding of how people are affected by living in a public fish bowl. Their parents should have protected them as children. Now this is all they have known. My opinion I think they got married because she got pregnant because their is no way she got pregnant after they got married and she be already has big as she is. But my opinion. Well, I guess we'll find out if your opinion is correct, won't we? I would be mortified if I carried large like Joy and Jill, and complete strangers commented publicly on how huge I was and that I must have committed fornication. Maybe it's me, but I'm a little confused that Austin's dad was so adamant about setting a goal for Austin to flip 5 houses before he could court Joy. But it was acceptable to court, her, propose, set the date, and marry her,knowing full well there could be an immediate pregnancy- all without a livable house for his wife??? Shouldn't Austin have gotten the house ready first, then courted Joy? The Bible actually says to plant the field, build the house, then take a wife- If you want to be Biblically correct. I'm not saying there's anything wrong with living in an RV. I'm saying that for Joy's comfort and security and their newly married sake- Joy's pregnant, Austin's been working himself at the Family Camp all summer, and trying to get the house done in the evenings and on Saturdays isn't God's best. Sorry! I'm not buying that-my brother's a professional Contractor and I know what means for my SIL and my nephews in terms of family time. I think they should have either courted longer , or stayed engaged longer. It was all too rushed, and they didn't even have time to finish the house. They totally should have waited longer before rushing to get married. I get that they wanted to get married as fast as possible, but they needed to just hold back and have more time for the wedding planning which would have eliminated stress on joy, and more time to build the house. Not too wise of them to rush like they did. Joy is actually going to live in a house even if it takes Austin a while to get it done. A lot of people live in apartments or rent places. He is making a home for them to live in for many years. They have a safe place to live in right now. It may be inconvenient for a while until the house is done but plenty of people live in motor homes year round. Maybe they get the engagement and wedding timing ideas from TLC's 90-Day Fiance? I also wondered why they wouldn't have waited until the house was closer to being finished before getting married. It must have been a tad disappointing for Joy to move into an RV when she was expecting a house. And, she is so young so there's no harm in waiting, really. They really should have waited and not rushed. They should have had more time to plan the wedding , more time to finish the house, and all the while enjoy their time of engagement. Could you please share a verse in the Bible that says a man should have a house before taking a wife? Proverbs 24:27" Finish your outdoor work and get your fields ready; after that build your house." God is a God of order- He didn't "people" the garden until He already had the means in place to support them and their potential children. Likewise, we're supposed to finish the preparations, have the means of supporting the wife and children financially, build the house to provide a place to live for the wife and children, then add the wife. In Genesis, Eve is the last addition, after everything else is provided for and in place. To be technical, God's plan for marriage originally included the husband would have no duty for one entire year. Deuteronomy 24:5 "For one year he is to be free to stay at home and bring happiness to the wife he has married.". Talk about an awesome Honeymoon! Joy gushed about being the first Duggar girl to own a home and it looks like she's next to last instead. I'm sure that wasn't what she had in mind, nor did it turn out the way she expected. Joy has traveled extensively around the world and has met many people who would be thrilled to live in that RV. Perhaps that's why she's thankful for it, instead of critical. She's 19, that's why she's thankful for it. She's probably been dreaming about getting out of her parents' house for at least 5 years. When I went to college I lived in a cinder block dorm room and it was amazing because it was my first place on my own. The difference here of course is that I wasn't required to wed just to move out on my own. It would've been weird having a husband in my dorm bunk, that's for sure. Such an awesome moment! Love the special keepsake.